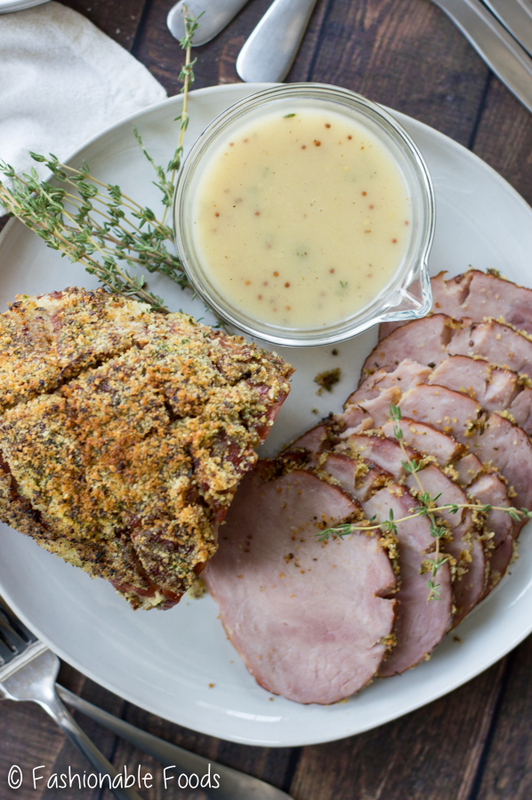 This impressive honey mustard and herb crusted ham with Riesling pan sauce is a must on your holiday table. It’s simple and is the perfect balance of sweet and savory. **This recipe was originally posted in 2014. 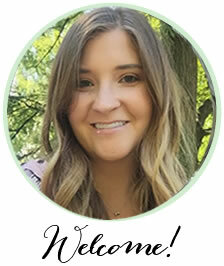 I’ve taken new photos and updated the recipe to make it a bit more special for the holidays! 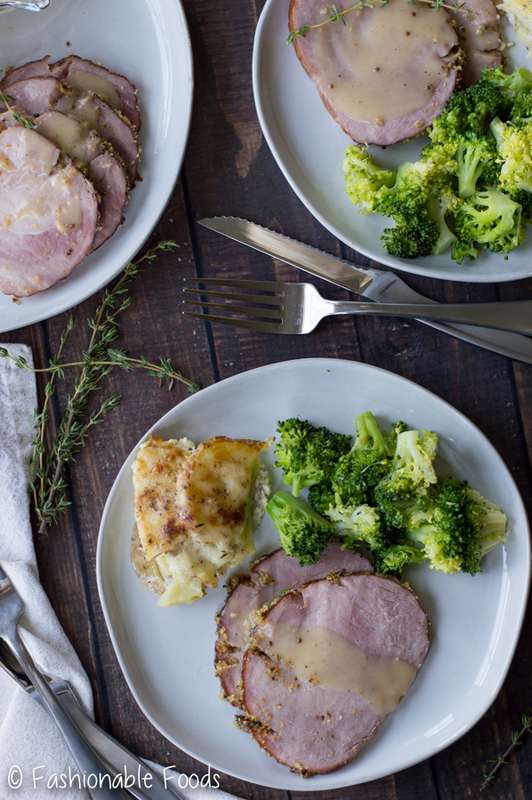 If you’re looking for a new, but flavorful way to prepare your holiday ham, this recipe is for you. In the past I’ve done a lot of glazed hams, which are delicious, but sometimes I’m looking for something a little more savory. 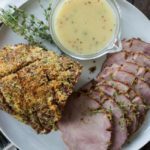 This honey mustard and herb crusted ham is the perfect balance of sweet and savory, plus has a nice texture thanks to the panko-herb crust. 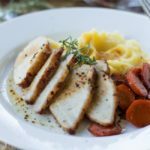 Drizzled with a Riesling pan sauce this ham screams fancy, but is really easy and requires simple ingredients. The great thing about making a smoked ham is that it is already fully cooked, so it just needs to heat through. You don’t have to worry about it as much like you would when roasting a turkey. I always cook my ham at a low temperature (325º) at 15 minutes per pound. So, an eight-pound ham takes around two hours. Side note: You can make this with any sized ham – I actually did it with a small 2 pound ham since there were just two of us eating it. 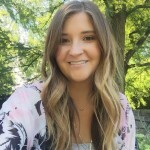 Check the recipe notes on the best way to adjust the recipe! In order to get the crust to stick to the ham we use a honey-mustard glaze. 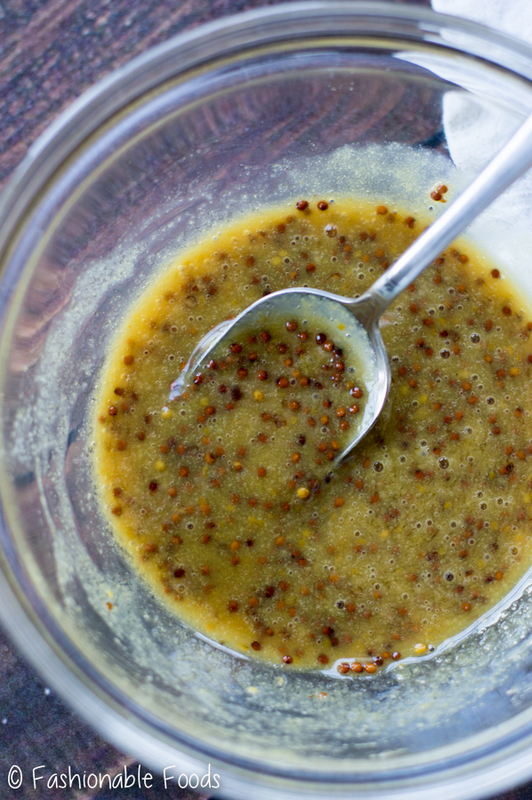 It’s super simple – just mix together dijon mustard, whole grain mustard, honey, and brown sugar. You can even do this a few days ahead if you’d like to get a head start. Halfway through the baking time, take the ham out and cover it with the glaze. Let it continue baking so the glaze adheres to the ham. Next, you’ll mix together fresh herbs, panko, black pepper, and melted butter. 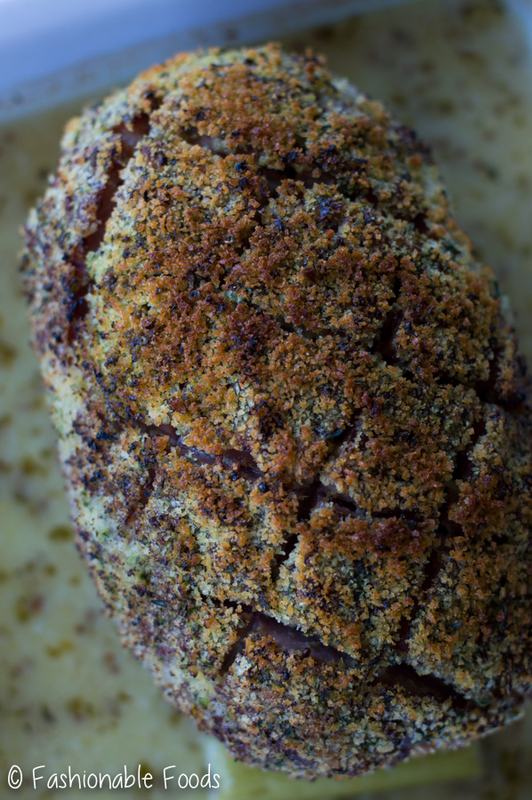 Increase the oven temperature to 425º and then cover the ham with the panko mixture. It will stick perfectly to the glaze and increasing the temperature allows the crust to get golden brown. Now let’s talk about the sauce. My original recipe didn’t include a sauce, but I’m definitely someone who loves a good pan sauce! This is completely optional, but it definitely compliments the ham perfectly. When you’re getting you ham in the roasting pan (before baking), add 2 cups of Riesling wine and 2 cups of water. The Riesling is a sweet wine that pairs amazingly well with ham. As the mustard glaze drips into the liquid it flavors the sauce with all that yummy goodness. Once your ham is done, let it rest and strain the drippings. Thicken them up with a roux and you’ve got the best pan sauce to pair with this impressive holiday ham! It’s also delicious poured over mashed potatoes. ? 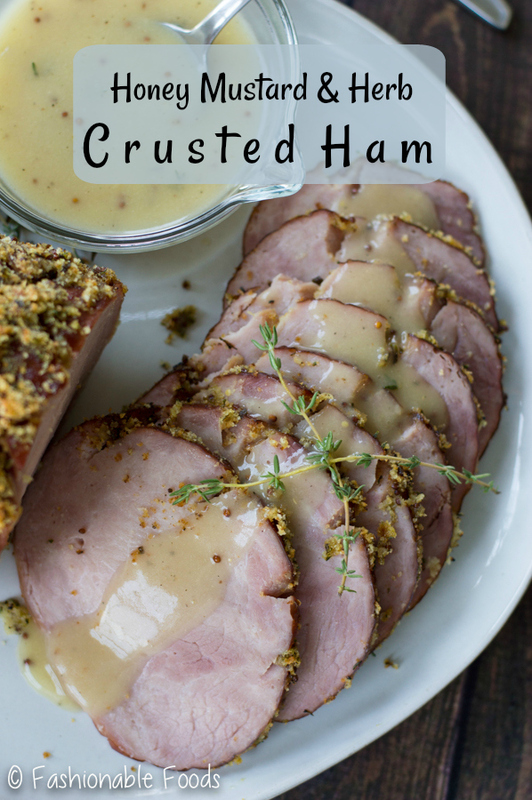 If you’re looking for something less sweet than the typical glazed hams, I think you’ll be pleasantly surprised by this honey mustard and herb crusted ham. It’s truly a great balance of sweet and savory and the mustard gives it the perfect tang. 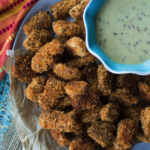 You’ll love the texture from the panko crust, too! Place the ham in a roasting pan with a rack. Pour the Riesling and the water into the bottom of the roasting pan. You want an inch of liquid in the roasting pan, so add more water if necessary as the ham is roasting. Bake the ham for 1 hour. 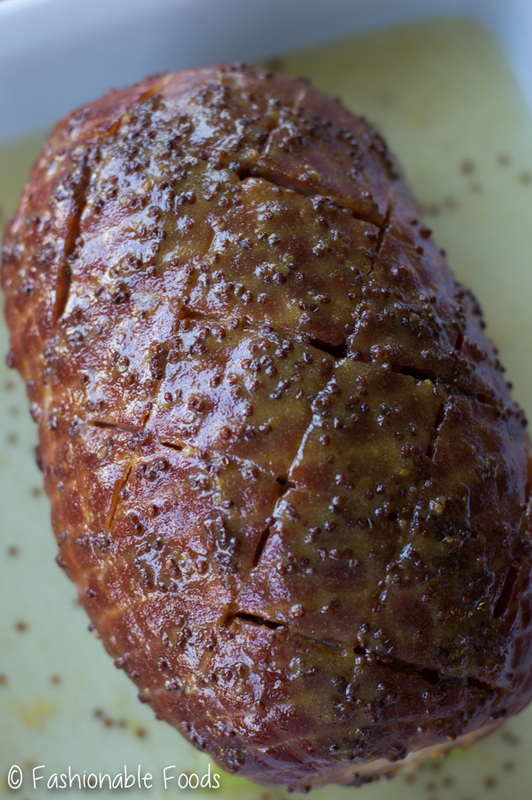 While the ham is baking, whisk together the Dijon, whole grain mustard, honey, and brown sugar. After the ham bakes for an hour, remove from the oven and cover it in the glaze. It’s ok if some falls into the pan – it will flavor the sauce! If needed, add more water to the bottom of the roasting pan. Continue baking the ham for another hour. 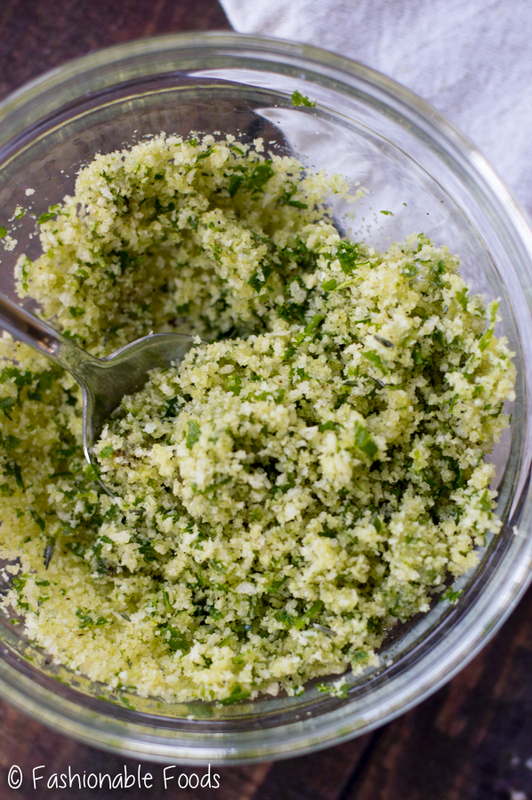 In a medium bowl, combine the panko, herbs, black pepper, and melted butter. Remove the ham from the oven and increase the temperature to 425º. Pack the crust onto the ham – it’s ok if some falls as you do this. I like to use a spoon and my hand to get the crust on in an even layer. Return the ham to the oven for 15-20 minutes, or until the crust is golden brown. Remove the ham from the oven and transfer it to a cutting board to rest, tenting with foil to keep it warm. Strain the drippings into a measuring cup. You want 4 cups of liquid. If you’re short you can add chicken broth or water. In a medium pot, melt the butter and then whisk in the flour. Cook the roux for about 1 minute and the pour in the pan drippings. Whisk the sauce until thickened and season to taste with salt and pepper. 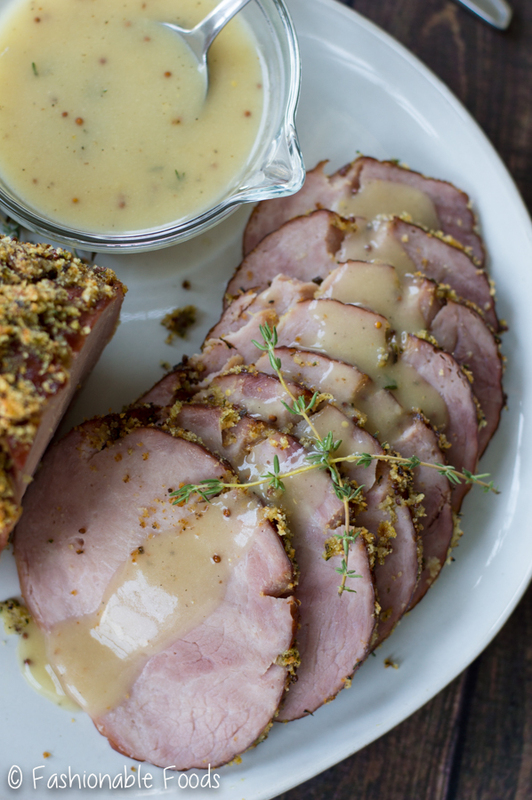 Carve the ham and serve it with the Riesling sauce. Enjoy! *You can adjust this recipe for any size ham depending on the crowd you are feeding. I wrote the recipe for an 8 lb. ham as I find that to be the size I typically get for a large group. However, I’ve also made the recipe using a small 2 lb. ham. Simply divide the ingredients by 4 to make a 2 lb. ham, by 2 for a 4 lb. ham, etc. Adjusting the cooking time is also easy – 15 minutes per pound at 325º (adding the glaze halfway through) and then regardless of the size, finish it off at 425º to brown the crust. This was excellent! It was a wonderful change from the usual honey sweetened hams. 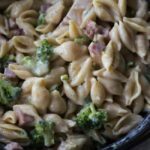 The leftovers are great, too, and mIx well with casseroles and pasta dishes. Thank you for sharing your recipe! I think i will do it success. I want to gain weight right now, is this something I should choose. Just looking at it is craving. You are talented!